With China’s first space laboratory, Tiangong 1, settled into orbit, it’s now time to consider the missions that will follow. We’re expecting China to perform two docking tests with the unmanned Shenzhou 8 spacecraft in November this year. 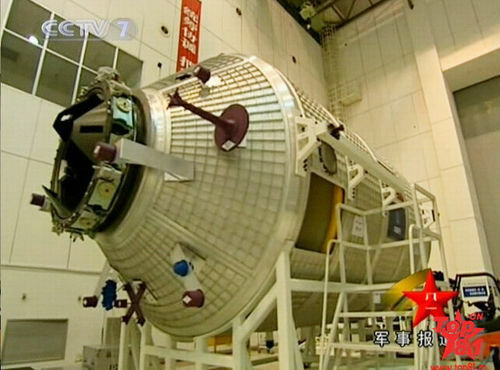 If that mission goes well, astronauts will fly to Tiangong 1 in the first half of 2012 aboard Shenzhou 9. They will do more than just dock with Tiangong. They will live aboard the laboratory. What, then, will it be like to live on board Tiangong 1? Prior to the launch of this spacecraft, we had little idea of what was inside. Computer graphics and animation was fairly nondescript. Since then, we’ve seen actual photographs of the interior of Tiangong 1 in the Chinese media, some of them taken while the module was in space. Tiangong looks a lot more user-friendly than I had originally expected. The small module has a fair amount of interior room for the crew and also has two sleeping berths. Chinese media have also described these sleeping berths as allowing astronauts to stretch out and control their own lighting. We can also observe that there will be more privacy and better isolation from the rest of the spacecraft. The interior is mostly white paneling, with darker tones for the “floor”, which also contains foot restraints. We can certainly admire the interior of China’s latest piece of habitable real estate, which makes Shanghai apartment prices look modest by comparison. But what does this tell us about the missions that will fly to it? Certainly, it suggests that long-term missions could be conducted fairly comfortably. With the added volume of the docked Shenzhou spacecraft, there will be a good amount of personal space for each crewmember. But how many astronauts will there be? We see two sleeping berths, not three. Does this suggest that Tiangong expeditions will only carry two astronauts? Not necessarily. The third crewmember could easily retreat to the Shenzhou spacecraft and stretch out in a sleeping bag, with nobody else around. In an earlier article (No Toilet for Tiangong) I speculated that Tiangong 1 would not carry a toilet or a galley. These messy items were best left aboard the Shenzhou spacecraft, which would need to carry them anyway for the flight to the Tiangong module. There’s nothing in the photos or the media reports to suggest that this is not the case. There appears to be a computer terminal on one of the walls, which could be a control system for the Tiangong module. It is less likely to be a control system for any on-board experiments. Tiangong does not seem to feature much in the way of gloveboxes, greenhouses or any of the typical experimental gear found on a larger space station. This lack of apparatus ties in with my earlier theory that most of the scientific work carried out on board Tiangong would be biomedical experiments on the astronauts themselves. Much of the gear on board the space laboratory is hidden inside drawers and behind panels. We can expect that a lot of these compartments contain tools, emergency equipment, and other basic necessities. Somewhere inside lurk some commemorative items that will be returned to Earth by the astronauts. The interior cameras look fairly advanced, suggesting that we could be treated to broadcast-quality video during the missions. Dr Morris Jones is an Australian space analyst. Email morrisjonesNOSPAMhotmail.com. Replace NOSPAM with @ to send email. Dr Jones will answer media inquiries.